In recognition of World Water Day, March 22, companies have launched campaigns to encourage consumers to reduce water consumption and raise awareness. With a growing world population and a dwindling supply of clean freshwater, access to water for drinking, hygiene and agriculture will be a contentious topic in coming decades. Xylem, Inc.’s Watermark program promotes corporate responsibility. Through partnerships with non-profits like Mercy Corps and Water For People, the company has helped provide and protect water sources for hundreds of thousands of people around the world. Two infographics detailing the need for access to clean water for daily living and especially after natural disasters are featured on the Xylem Watermark Facebook profile. The company has pledged to donate $1 to Mercy Corps and Water For People for each share the graphics receive, respectively. Sharing this image on the Xylem Watermark Facebook page earns Water For People $1 each. The first graphic, titled Providing Water, illustrates an Indian example of a global phenomenon in which girls and women spend up to six hours per day carrying water from its source to their homes. This prevents them from attending school or other kinds of gainful activities. Through projects like building pumps and gravity pipelines, Xylem Watermark and Water For People have impacted 200,000 people in India, helping to create more time in the day for families who need it. John Sauer, assistant director of Thought Leadership, Water For People, confirmed that long-term planning is one of the most central aspects to their projects. The latest initiative, titled “Everyone Forever,” works to reach everyone in the community including clinics and schools. The goal is aimed at project maintenance by creating affordable and easy projects that local communities can do on their own. Water For People also encourages local communities and governments to get involved, reducing the need for outside economic support. When they began their India project, 85 percent of costs were contributed from Water For People-donated funds. Now, only ten percent of the total cost comes from Water For People. They still monitor the outcomes of the projects for at least ten years to ensure they work. Sometimes, Xylem provides volunteers to go into the field to follow up. The partnerships work in part because Xylem Watermark does not force use of its primary product, pumps, in order to participate. Water For People and Mercy Corps gain expertise and financial support in addition to equipment. Based on local communities’ needs, pumps are not always the most sustainable or practical solution based on maintenance, climate change, and population growth in addition to local conditions. “Rural areas may not have the electricity or capacity to use our water pumps so we don’t insist on our own products for cases like that,” Fields said. Mercy Corps earns $1 for every share this graphic receives on Facebook, featured on the Xylem Watermark page. Protecting Water is the second graphic, which shows a flood in Indonesia. Drinking water is usually the number one need after a disaster of any kind. Xylem Watermark has worked with Mercy Corps for four years to secure and protect water resources for communities around the world. One project in Indonesia involves a coastal village that relies primarily on shallow freshwater wells at a household level. There are also freshwater springs up a nearby hill, but an infrastructure had never been developed since the wells met people’s needs. However, in the event of a tsunami, the wells would be contaminated with seawater and unusable. Therefore, Mercy Corps, with the help of Xylem Watermark, has assisted the community with building piping from the springs in case of disaster. There is a local committee in place for maintenance of the pipes. Craft adds that in the case of a disaster, Xylem has come to the aid of Mercy Corps by lending submersible pumps that can be used in floods. The two organizations partnered to provide relief during the floods of Pakistan and Haiti within the last few years. In its 19th year, the United Nation’s World Water Day works to bring awareness and change for the global plight of water. This year’s theme focuses on food security and water scarcity. According to the UN-Water World Water Day Team, a person needs to drink two to four liters of water every day, but it takes 2,000 to 5,000 liters of water to produce one person’s daily diet. 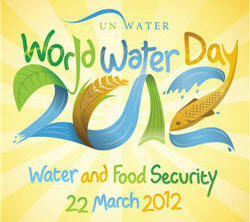 This year's World Water Day theme illustrates the relationship between water and food security. Irrigation uses 70 percent of water withdrawals at the global level, the Team reports. One kilogram of wheat requires 1,500 liters of water while one kilogram of beef requires ten times that amount. Additionally, approximately 30 percent of food produced globally is wasted at the consumer level, mostly at restaurants and grocery stores. That equals about 1.3 billion tons of food that wastes the resources required to make it. Teva, the manufacturer of outdoor sandals and other gear, is asking participants to give up water in one area of their life for the day. The company suggests giving up a shower or cooking without water for a 24-hour period. The Teva Facebook page hosts graphics and facts that users can share along with their account of living without water in one facet of their daily life. Teva challenges its Facebook friends to reduce their water footpring for just one day with this infographic.